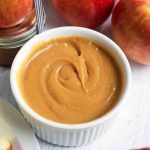 Delicious, sweet Instant Pot Dulce de Leche Caramel is a versatile dessert that is a dip, topping, filling, or a coffee stir-in. You can make this pressure cooker dulce de leche much faster than on the stovetop or crock pot, without having to watch it. My favorite sweet flavor is caramel. I love it on ice cream, as a candy, as a cake filling, in a latte, and to dip my apples in! The buttery rich flavor is just irresistible to me! Caramel apples are my favorite! Instant Pot Dulce de Leche caramel is a little different than regular caramel. The flavor is not exactly the same. It’s hard for me to explain. It is creamier, and doesn’t get as hard and chewy as regular caramel. It’s pretty close though, and it tastes really good! 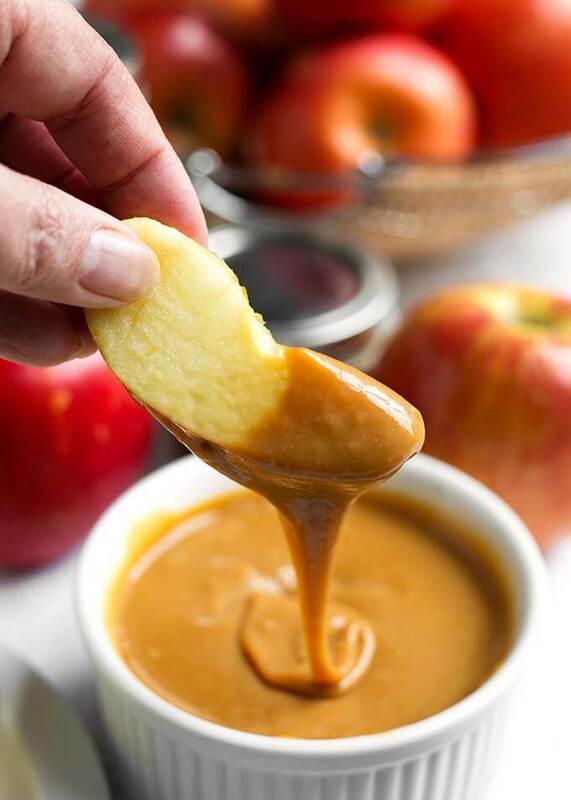 Dulce de Leche is actually sweetened condensed milk that has been heated slowly, and then changes into a caramel like substance due to the Maillard reaction. It becomes darker the longer you cook it, and the flavor deepens. My personal preference is not too dark, but you may like it that way. Instant Pot Dulce de Leche Caramel is much easier and faster than other methods. In a slow cooker it takes a day of cooking and a day of cooling! 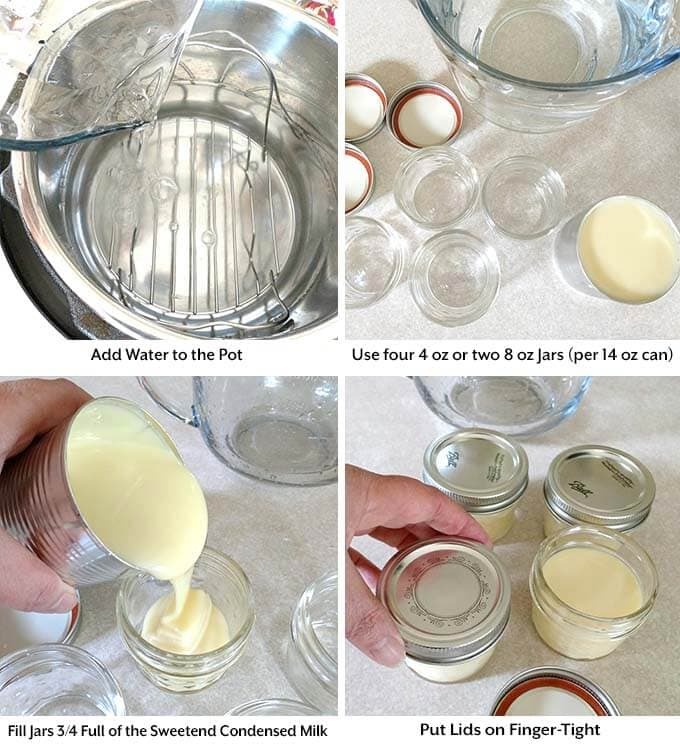 Since you make the Instant Pot Dulce de Leche Caramel directly in the jars (use canning jars), you can get four 4 oz or two 8 oz jars from a 14 oz can of sweetened condensed milk. If you use the 4 oz jars, you will have individual servings! Stick an apple on top and add a cute ribbon and you have the sweetest little gift (pun intended)! 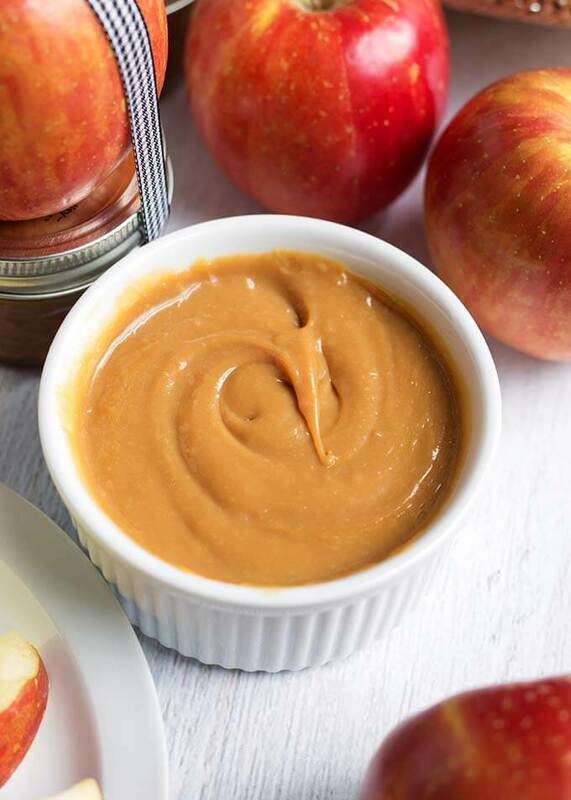 Instant Pot Dulce de Leche Caramel is a delicious, easy to make, caramel like confection that makes a sweet dip for apples, a cheesecake topping, a cake filling, or coffee stir-in! Put the trivet in the inner pot of the pressure cooker. Pour 5 cups of water into the pot. 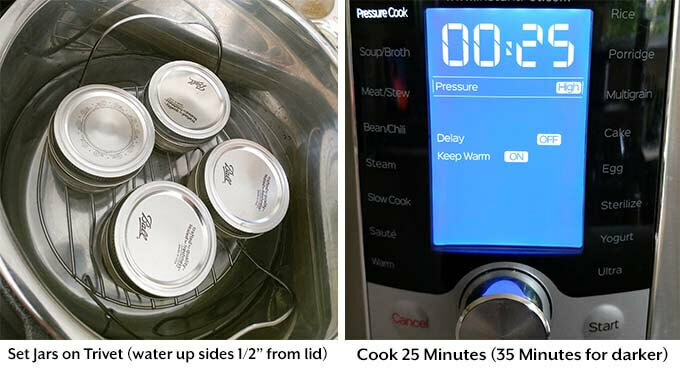 If you are using a larger or smaller pressure cooker, you will need to increase or decrease the amount of water. You will want the water to come up most of the way, to just under the metal ring of the lid on the jars. Open the can of sweetened condensed milk (SCM) using a can opener. Pour the SCM into the jars, dividing equally. Put the lids on the jars, and twist to close just "finger tight." You don't want to tighten the lids too much at this point in the process. Put the jars in the pot, setting them on the trivet/rack, not touching each other or the pot. Make sure the water level comes to just below the lid rings. Close the lid and seal the vent. Press the Pressure Cook/Manual button or dial, and then the + or - button or dial to select 25 minutes (35-45 minutes for darker result), and make sure it is set to High Pressure. After cooking time has ended, turn off the pot so it doesn't switch to the warm setting. Unplug it if necessary. Let the pot do a full Natural Release, and do not disturb the jars until they (and the water) have cooled completely. This helps reduce the possibility of any jars breaking. It can happen, as it might in actual canning. After the water and jars have cooled completely, remove from the pot to a towel to dry the jar. Open one up and sample the goodness! If the texture is not as creamy as you'd like, just stir it with a fork really well or whisk it. Keep in the fridge for up to a few weeks, if it lasts that long! 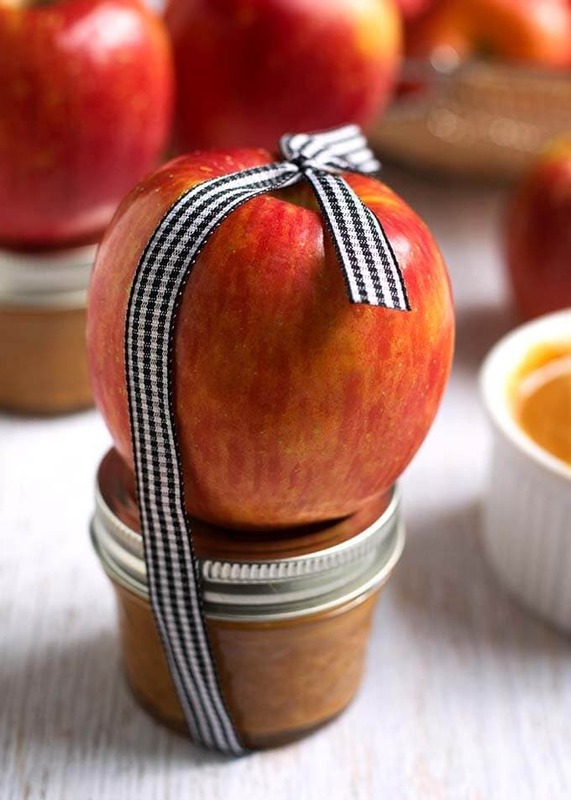 These make a cute gift, packaged with an apple for dipping! Spread over a cheesecake, add a dollop to a cup of coffee, or serve on ice cream! Or, eat it right out of the jar with a spoon! This is the most delicious thing I have made in my pressure cooker! It was so easy. I gave some to my coworkers and they couldn’t believe that I made this in my pot! I will be making this again and again! Hi Beth! I know, it’s hard to stop eating it! I’m so glad you and your coworkers liked this dulce de leche! Thank you for your review! How long will this keep? I’d like to make for Xmas gifts as far in advance as possible. Thanks! I have kept mine in the fridge a couple weeks. I want to make this and send to my family in AZ. Does it need to be refrigerated? I think it can go a day or two in a cool environment. If you ship it to them, use express shipping and put lots of packing material around it to insulate it. Let them know to put it in the fridge when they receive it.